iSyncr provides you with a very straight forward and easy-to-use application that can be used for synchronizing the iTunes library with your Android phone. 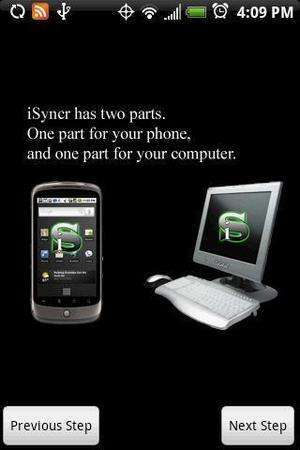 iSyncr requires you to have the mobile version of the application installed on your handheld device. Then, you will be able to send your whole iTunes library to the phone over USB or WiFi connection. For security reasons, you should also check out the iSyncr download at LO4D.com which includes virus and malware tests. Additional screenshots of this application download may be available, too.